Varistors are voltage dependent, nonlinear devices which have an electrical behavior similar to back-to-back zener diodes. The symmetrical, sharp breakdown characteristics enable the varistor to provide excellent transient suppression performance. When exposed to high voltage transients the varistor impedance changes many orders of magnitude from a near open circuit to a highly conductive level, thus clamping the transient voltage to a safe level. The potentially destructive energy of the incoming transient pulse is absorbed by the varistor, thereby protecting vulnerable circuit components. ◇ Absorption of switching surge from various kinds of relays and electro-magnetic valves. ◇ Electrostatic discharge an spike noise suppression. 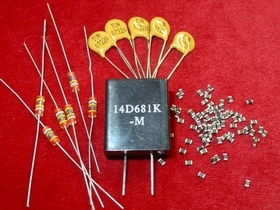 ◇ Protection of various kinds of transistors, diodes, ICs, tyristors, triac semiconductors and etc. ◇ Automobile control system such as transistorized ignition system and electronic fuel injection system, and etc. Flame Retardant Grade Polyamide 8 (PAS), glass reinfarried. ◇ Suitable for air-conditioner, UPS , Power Strip and automatic control facilities application etc.